It is in the minds of many; a will to search, a driving urge to find that which is new and undiscovered. These are the scholars, the wizards, the explorers; maybe even the homeless pets that pick out simple tunes on their little instruments and are content to exist without wealth. Whichever forms they come in, these people are the hope for the future. While most ask and then forget, these ask, and ask again. Look out for them; they are hope incarnate. - Akira Amira’s Reflections In A Shattered Mirror (Chapter Three, Stars in the dark). She raised one eyebrow, but walked beside him as he left the Manor, striding with confidence into the early morning sun. “I like libraries. Nice places to be.” The response was vague, but as she was beginning to get to know him better she was also beginning to realize that it was pointless to ask further. Zeekaye liked the library at once. It was spacious and comfortable, but with no shortage of quiet little nooks where you could spend hours submerged in the texts. The shelves lined all the walls, and as the library was roughly decagonal, there were rather more walls than you would expect. “Ha. Quite, quite.” Zeekaye waved a distracted hand. “I’m sorry, I should have been more specific. What I was wondering was why I am here, as opposed to back home, where I technically should be.” He paused from reading and looked up into the distance. “Phizith will be burning holes in the carpet by now,” he said, and something of the malicious glee in his voice brought up the question as to whether he was really the quiet, serious scholar he pretended to be. “Thank you!” Zeekaye took them and immediately opened the first. For the next few hours he was utterly submerged in the world of printed text and paper. The maid gave an internal smile – she knew his type – and wandered off amongst the shelves. As the sun began to fall, Zeekaye sighed in frustration and let the book he was halfway through fall to the ground. He hadn’t discovered anything. A few fascinating things he hadn’t known before, but nothing useful. No reason why anyone would want to kidnap him and take him here. He rubbed his temples and blinked away the slight headache that came from reading all day. “We’d better get going,” he said, standing. Right on cue, the Usul came up to him, ready to guide him back. “Here,” she said, handing him several more books. He blinked. They began to walk back. “I’m not about to be chased down by a rabid librarian demanding I return his books, am I?” Zeekaye laughed. The Usul turned her eyes to the ground and said nothing. “Yes.” There was amusement in his tone. She looked up at him, and the same amusement was mirrored in her eyes. She stared at him for a second, and then the corners of her mouth twitched into a returning smile. They worked together a lot better after that. Phizith started off by searching Zeekaye’s room. He didn’t really expect to find anything there, but it felt better than doing nothing. His raindorf Rune played with Muffler in the corner. After ten minutes, the Pteri had to admit he wasn’t getting anywhere and sprawled on Zeekaye’s bed. The Korbat would be extremely annoyed if he knew Phizith had done that. Which was, of course, exactly why he was doing it. The Pteri laced his fingers behind his head and looked up at the ceiling. The top story of the house was made of Cloud. Zeekaye had insisted. Cloud could be pulled back so you could exit at any time, and it could block the hole again, or be pulled thinly across it so you could see through without exposure to the elements. Plus, there was the aesthetics. Nothing was quite so pleasing to the eye as a nice fluffy cloud. The cloud ceiling was pulled back into a sort of skylight. Phizith supposed that Zeekaye had drifted off staring at the stars. That was so typical of his brother that he couldn’t help but grin. The skylight was probably the way they had taken Zeekaye. Phizith was a little surprised, as there was no evidence of a fight. Maybe Zeekaye had just been tired, or maybe they had used some kind of potion to keep him out of it. Phizith frowned as he thought that he was no closer to discovering who ‘they’ were than he had been yesterday. Phizith sat up straight as something occurred to him. They probably wanted Zeekaye for a reason. Maybe martial, maybe intellectual, maybe political, who could tell? But they probably didn’t want him too much more hurt than he already was. So maybe they didn’t use the skylight at all. Maybe they used magic to transport him. And magic leaves traces behind. Phizith grinned. Finally, he was getting somewhere. “Tap?” Phizith knocked on the door, a little redundantly as he had already walked in. His younger brother put down the comic he had been reading, gave a long-suffering sigh and got to his feet. “Yes?” the Kyrii asked, pushing his lank grey hair out of his eyes. “Do I look like I have anything better to do with my time?” Phizith grinned. Tap told him the address. Phizith nodded, but his thoughts were already on the inn where he’d find this Everett character. “Who would have guessed there were inns on the Citadel?” the Pteri muttered, staring up at the only one he’d seen. It wasn’t as comfortable looking as Meridellian inns, but the food, when he sampled it, was less plain and a whole lot spicier. Fortunately he didn’t mind hot food, but there was a nasty sweet/sour/savory/who knows what combination in the sauce that made him gag. Phizith’s poor, abused taste buds were still crying out for mercy, and this was rather distracting, so he only noticed the stranger opposite him when he spoke. The words were ominous without being blatantly threatening, the perfect words to be spoken in a dark, shabby inn with Spyders hanging from the candles. Unfortunately it was still early in the day; the effect would have been better without the bright sunlight somehow shining through the grubby windows. Just how he had heard that was a mystery to Phizith, as he hadn’t started to ask questions yet. The Pteri just nodded, presuming that, as this was a magic user, he had sensed it or something arcane like that. “Why do you seek me?” He was a Blue Ogrin, and his exact age was difficult to guess. He wore a necklace of charms around his neck, but otherwise his clothing was plain and unadorned. Tapejar had called him Everett. Phizith silently passed over a handful of gold coins, the remnant of an odd adventure involving a Zafara thief and the Snowager. Phizith showed him to his house without saying another word. He wasn’t sure whether he should trust this greedy magician. Zeekaye was on his balcony. He wasn’t quite sure why he was there. Sure, the wind was nice, and the fresh air, and watching the sun dip below the horizon and the first stars beginning to speckle the sky, but that wasn’t all there was to it. Maybe the feather had been a message. Maybe it had been the alero – free-flier. Maybe. Or maybe Crokabek had mobbed an innocent Vullard flying overhead. Who could tell? If it had been the... free-flier, then Zeekaye wondered what he should feel right now. Hate might be a good bet, but he didn’t like to hate – it was a waste of energy and time, and achieved nothing. Fear – no, he wasn’t afraid, not really. He’d been beaten once. He wondered, idly, why. Free-fliers caused trouble. Everyone knew that. They were wild cards, teaching themselves to read the wind and the sky as well as any Aviant, but without the proper training, their ethics were sometimes rather suspect. That’s why he’d been sent to catch this one. The attack had been brutal and unexpected. He was an Aviant, he was a Korbat, and it was at night. He should have had the advantage, but he’d been caught by surprise. The girl had flown well. The girl. She’d been a Pteri, a Brown Pteri, although it was difficult to tell her colour in the moonlight. He winced as he remembered. She’d been fast, impossibly fast, and her strong tail had slammed viciously into his fragile wings again and again and again and again, until he could not bear to use them and surrendered into freefall. Which hadn’t turned out too badly, considering. He had been drifting, lost in his thoughts for who knew how long, when he shook himself with a start. The stars were out truly now, in all their blazing starry glory. The wooden rail had dug a mark on his arm. If only those books had had something. If only he knew why he was here. Mysteries were fun, but only if you could find the key to solving them. Or if someone found the key for you. There was a book – medium sized, hardback, dull green cover, just the kind of book he liked. The title was Reflections In A Shattered Mirror, printed in plain script. In between the cover and the title page, a Brown Pteri wing feather was trapped. It fell out when he opened the book. 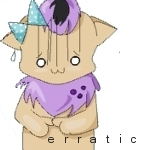 The Darigan Korbat watched it fall to the ground, so far below. Then he went back inside. And read. 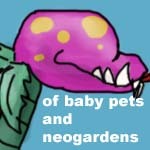 Ever notice how on Neopets a lot of plants are dangerous?